I pulled into the SFI parking lot late, the full moon bathing the grounds in a crisp, white glow. No headlamp needed as I quickly set up a barebones cowboy camp, eager to begin the next morning with a fully rested brain. Once nestled into my sleeping bag I noticed my relief and excitement at finally being here. I was finally taking the time to get down to the nitty gritty details of my favorite subject—the vast and mysterious kingdom of plants. Although plants have always been an integral part of my life, a new job as Noxious Weeds Program Coordinator for a local restoration council challenges me to understand the immensely diverse floral communities of the Klamath-Siskiyou bioregion and how invasive species impact these rare ecosystems. Having never seriously pursued plant taxonomy courses in school, attending a three day crash course that emphasized native species seemed like a no-brainer. Thankfully my council’s directors had agreed, and I was allowed to miss a couple days of work to attend. Under the protection of a majestic incense cedar, I prayed to the moon that the Crash Course in the Flowering Plant Families would give me the support, structure, and confidence needed to tackle the daunting task of learning plants in the Klamath-Siskiyou Mountains. Just then a large fox pranced into the clearing, its elegant curves silhouetted sharply by the moonlight. Class began at 8:30 the next morning. Tables were set up with microscopes and handouts, and students had their mammoth Jepson manuals ready to go. We were a friendly, unassuming bunch, ranging from millenials to retirees, all ready to get serious about this passion for plants we’d been harboring for years. Our backgrounds in botany varied widely, from agency workers who work in the field on a regular basis, to a retirement-age couple from New Hampshire traveling the country seeking out wild orchids, to a college botany instructor searching for ideas for teaching her own classes. Our teacher, Linda Vorobik, took notes as everyone introduced themselves, and then filled us in on her interesting life as a botanical taxonomist and accomplished artist with encyclopedic knowledge of native plants from most west coast bioregions, including those of the diverse Klamath-Siskiyou and Sierra Nevada ranges. Open, gracious, energetic, clear, attentive and the most importantly, hilarious, Linda lit the path and we joyfully followed. She provided three informational handouts and a schedule outlining the basic structure of each day, which always began with a lecture, followed by keying practice, followed by a field trip. At first I was intimidated by the sheer number of new names included in the handouts; they would prove invaluable for the practice and retention of this freshly acquired knowledge. Now that I’ve had two months to contemplate the material, I’m awed by how many hours of teaching have gone into the design and editing of these documents. In addition to my class notes, Linda’s material effectively summarizes the most useful parts of a taxonomy textbook and local field guide into just a few pages. During that first hour of class she knew we were feeling overwhelmed, so reassured us that while there was going to be a lot of information hurled at us over the next three days, we did not need to worry about memorizing everything. After spouting off a few complicated Latin plant names like most people would say “rose” or “daisy,” she recommended that we “just absorb what you can and leave the rest. Remember, there’s not going to be an exam!” Good advice. Linda Vorobik with students in the lab. Right, entomologist Rich Little works on memorizing plant families for use in his field work. Linda’s first lesson introduced us to the area we would be exploring and her history with it. This included falling head-over-heels with the magical Klamath-Siskiyou flora, many years studying native rock cresses (e.g. Arabis spp. ), working with local heroes of botany, and sharing her beloved Siskiyous with hundreds of students before and after the 2002 Biscuit Fire dramatically altered the landscape. We wrapped up the first morning familiarizing ourselves with major taxonomic divisions and basic terminology critical for using Jepson or any other flora, then solidifying what we’d learned by practicing on real specimens Linda had collected. The hands-on approach, the casual way Linda peppered her speech with interesting facts and subtle repetition, the way she kept everything in context while progressing from simple to complex, as well as her gorgeous and highly-illustrative photographs, kept us rapt and left me feeling engaged and hungry for more. After lunch-with-a-view on the porch, we caravaned into the mountains. Following 8 Dollar Mountain Road as it snaked through serpentine zones just on the edge of the Kalmiopsis Wilderness, we made a handful of stops where Linda knew we would find plants from a wide range of families. Linda shared her knowledge of broad-scale ecological wonders such as the patchwork of soil types made visible by the density, size, and species of plants covering the rugged mountains. We got our fill of difficult-to-spell Latin names, and what Linda referred to as “movie star” plants. The SFI “Crash Course” botanizers at Poker Flat. Photo by Chelsea Reha. comments as we worked. Her botanical artwork was a wonderful and unexpected bonus. The course began with a lesson in plant anatomy and terminology, complete with excellent handouts featuring Linda’s detailed illustrations. 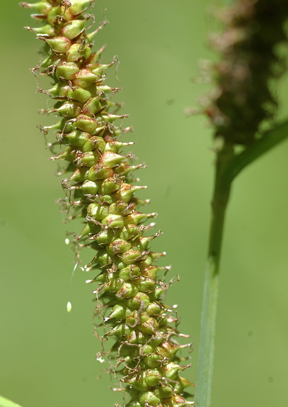 Featured plant families of the course were Cyperaceae, Asteraceae, Juncaceae, and Poaceae. They are all challenging families with specially modified anatomy and unique terminology. Although it was late in the season, we found plenty of plants to key along Deer Creek and in the adjacent fen. Among the many things that we identified from Deer Creek Center were Glyceria grandis, Panicum acuminatum, Carex mendocinensis, Carex nudata, Juncus orthophyllus, Juncus xiphioides, and Deschampsia cespitosa; all common and lovely native plants of Selma. 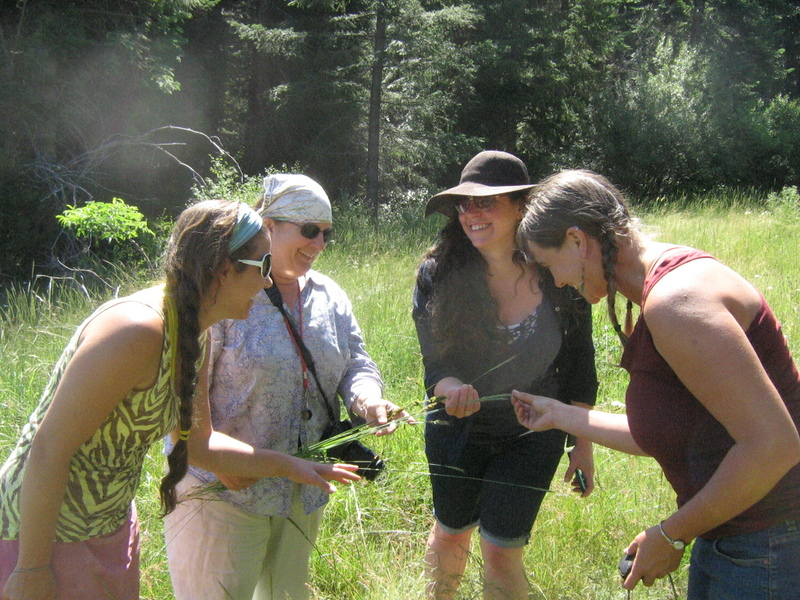 Class members trying to identify a sedge with instructor Linda Vorobik (second from left). Photo by Chelsea Reha. 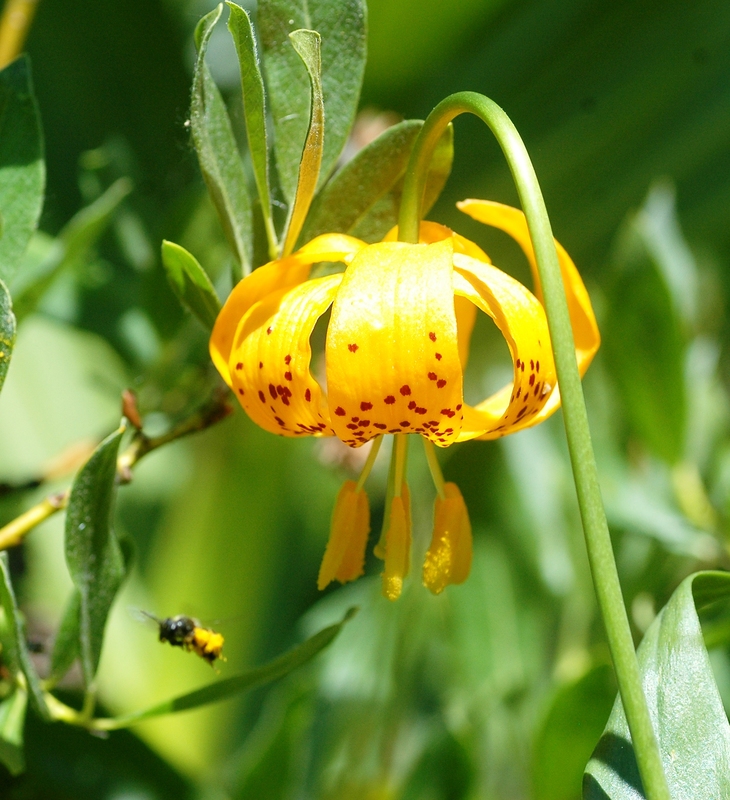 Lilium pardalinum wigginsii and pollinator friend photographed by Linda Vorobik. Carex amplifolia at Poker Flat. Photo by Linda Vorobik. and Luzula species as well as many native members of the family Poaceae such as Danthonia californica, Hordeum brachyantherum, Elymus elymiodes, Elymus glaucus, and Phleum alpinum. This was a great class and I look forward to more classes from Linda Vorobik and from the Siskiyou Field Institute.Taking this course expanded my botanical knowledge as well as my appreciation of the Siskiyou Field Institute and the enthusiastic students and educators that the institute draws to our unique region. As a resident of Selma, I feel so fortunate to have this resource in my backyard. Thank you to everyone who has contributed whether as an educator, student, board member, volunteer, etc. 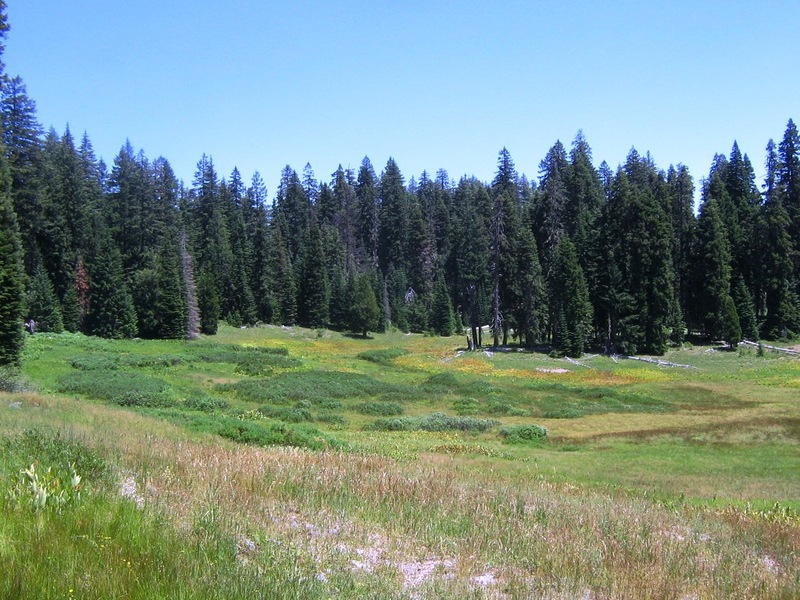 May the Siskiyou Field Institute have continued success in the beautiful Illinois Valley! 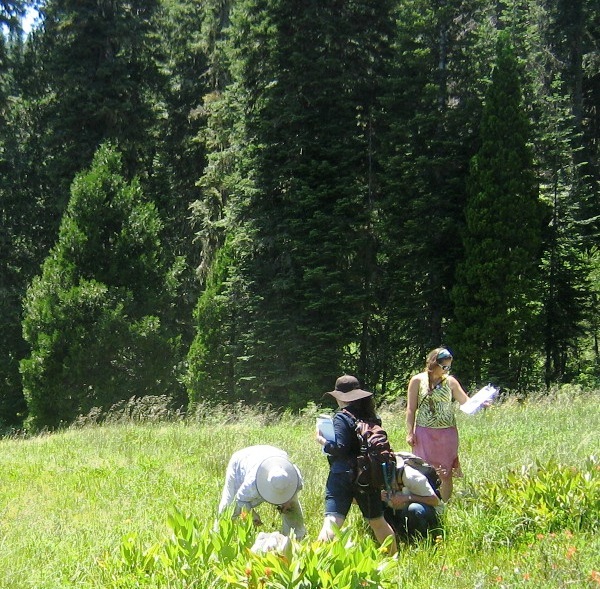 I look forward to the Butterflies of the Siskiyou Region workshop each year, It is a fun way to learn about butterflies and moths at a comfortable pace, and spend time with friends and people who appreciate nature and enjoy learning. saw some slides and then went out into the field with nets and viewing jars and identified the butterflies and moths with the help of our instructor Dana Ross who maintains his enthusiasm and encourages participants and patiently identifies the species over and over. It takes a while to learn butterfly species because they look so similar. That’s why I keep taking the class. Day one we went up to 8 Dollar Mountain, Day two we chased butterflies on the Bolan Lake road but couldn’t reach the lake because of snow. On Day 3 we visited the Cascade-Siskiyou National Monument. Polyphemus antennae under the microscope. Note the feathery structure of moth antennae compared to butterflies. Photo by Goly Ostovar. previous evening. I volunteered to go with him; it was quite interesting to see how the traps work and how each one had collected different species depending on the habitat. I was amazed to see how many species were in the trap just on one night and was very excited to learn about the Polyphemus Moth. Even though it is a common species, it is beautiful, I was fascinated by close-up views of the antennae. I learned that they use them to orient and balance in space. while flying. Polyphemus Moths don’t eat as adults and only live a maximum of only 4 days. Their entire life cycle averages about 3 months. Moths often elude us because they fly at night and they are harder to learn about. But now I am more curious to learn more! Hopefully next year. A healing and rejuvenating force, wilderness has the power to bring out an individual’s true nature, fostering honest connection with self, others and the earth. The nine-day, July SOP (Summer Outdoor Program) backpacking trip presented this opportunity for five high school participants. As the trip progressed, the Kalmiopsis Wilderness worked her magic. Diving into the waters of the Illinois River, the negative elements of home life clinging to each of the participants began to wash away. Beginning to let go of the outside world, the group of students from high schools within Oregon and California were able to slip into the wildness of the Kalmiopsis, simultaneously easing into their true selves. Open and receptive, the group began to develop deep relationships with the environment as well as each other, bonding over heavy packs, wildlife sightings, shooting stars, mosquito bites, likeminded journal entries, blackberry picking, early morning swims and late nights by the fire. Together, the group became more and more self-sufficient and comfortable with life among the trees, spearheading bear hangs, constructing tarp shelters, building and maintaining the evening fires, filtering group water, navigating maps, cooking delicious meals, and eventually welcoming the challenge of a 24 hour solo. Throughout the nine-day trip, these experiences within the wilderness fostered self-exploration among the group members, ultimately furthering their development of self-trust and empowerment, both applicable and integral to the entirety of their individual lives. These are gifts offered by the wilderness. By partaking in the SOP experience, the participants were provided with the opportunity to begin to unwrap these gifts of the wild.